If you're getting an error "Invalid login. Customer access is disabled." 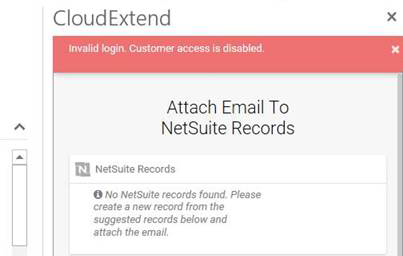 the issue is generally solved by enabling web services (all users that wish to use CloudExtend must have NetSuite web services enabled for their role). Contact your NetSuite Admin and ask them to enable NetSuite web services for your role. Your Admin will likely know how to do this already or they can follow the steps below.